European Wii U owners are suddenly facing a bit more of a wait before they too will have the opportunity to punch Batman through a skyscraper. Man, what is going on with the Wii U version of NetherRealm Studios' Injustice: Gods Among Us? 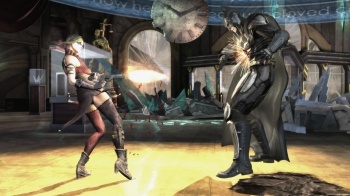 Way, way back when the Wii U was still a hot new thing (read: before it launched), publisher Warner Bros. Interactive announced that the DC comics-based fighting game would appear not only on the PlayStation 3 and Xbox 360, but also on Nintendo's latest console. Nintendo has made a concerted effort to aim the Wii U more directly toward "core" gamers than the casual set who propped up the Wii, so this all made sense and it seemed likely that the Wii U iteration of Injustice would be a perfectly solid fighting game. That's when things took a turn for the worrying. First, it was revealed that the Wii U iteration of the game wouldn't see the same Collector's Edition treatment as its PS3 and Xbox 360 counterparts. Lame, right? Absolutely, especially as it could have potentially been the console's first chance to receive a solid, mass market, arcade-style fighting stick. Then, this morning, Warner Bros. announced that the release date for the European Wii U version of Injustice has been delayed. Initially the game was to launch on April 16 on all three platforms, but now, for some unknown reason, European fans won't see the game until April 26. Granted, that's a minor delay, but it's yet more bad news for the title and the Wii U in general - a console whose sales figures leave a lot to be desired. We have attempted to contact Warner Bros. and NetherRealm Studios to inquire as to why this delay had been instituted, but neither firm has yet responded. If/when we hear back we'll update this piece with more information, but for now this remains a mystery.